“This bottle was inspired by the ‘bladder’ shaped wine bottles manufactured in England between about 1715 and 1740. In Britain, where they were used mainly in the 1720s and early 1730s, ‘bladder’ wine bottles were relatively unusual but their use in continental Europe was more widespread. The particular variant on which this limited edition bottle was based, with its narrow oval profile, is often described as having a ‘flat chestnut’ shape. ALWAYS A GOOD TIME FOR PORT! When it comes to dessert wines, we feel that Carpe Vino has one of the best selections for a restaurant/wine shop in the region. From our extensive collection of Tokaji’s, to true port from the old country or even California-bred Prager Port Works in Napa…we got ya covered. 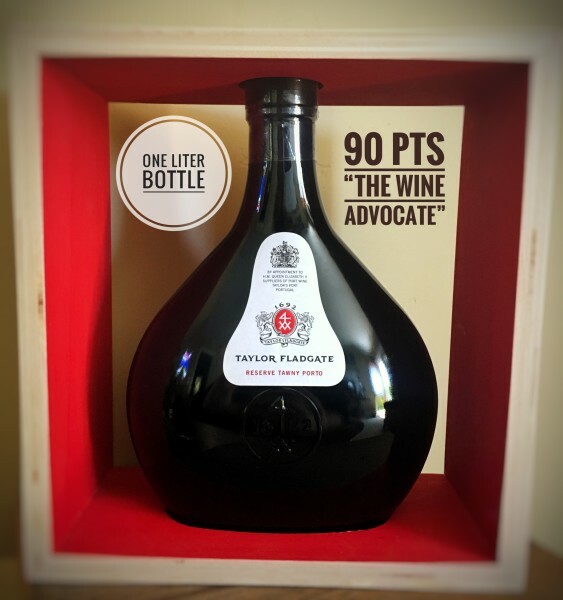 When it comes to Tawny Port…there is definitely one producer we set high up on a pedestal and that is Taylor Fladgate. When this rare treat set sail our way we knew to welcome it with open arms because our faithful port fans would love it! From the quality and craftsmanship of the wine, throwback era bottling, to a minuscule production…this PORT NEEDS TO BE IN ANY WINE COLLECTION. With only 30 bottles to be had and only $59.95/bottle…do yourself a favor and click the BUY NOW button below. Don’t trust us? PICK-UP ONLY. NO SHIPPING DUE TO PACKAGE SIZE. “A core of deep brick red fading to russet on the rim. A beautifully mature and complex nose, full of evocative, subtle nuances. Aromas of plum, fig and sultana blend with a mellow redolence of marzipan and butterscotch.